Many musicians are really passionate about the art form, keen to share their love for music with their listeners and others. Meet a musician who is so overcome by one particular composer that he even started a trust, Guruguhaamrta, to express his love and respect for the composer. Sruti recently spoke to Carnatic vocalist G Ravi Kiran, disciple of T.M Krishna, about his music and his fascination with Muthuswami Dikshitar. How did your tryst with Carnatic music begin? My first guru was Gayatri Kesavan who noticed that I could sing. She taught me the introductory lessons of Carnatic music. I later learnt from Vasanta Ramanujam and RS Ramakanth who then suggested I learn from his father, the legendary Sangita Kalanidhi RK Srikantan Mama. It was in late 2002 that I started learning from TM Krishna Anna. I am grateful to all my gurus who have been instrumental in my musical journey in various ways. How has learning from various gurus influenced your music?. What would you say you have imbibed from them? It took me a few days to gather the courage to talk to Srikantan Mama, but once I did, I was pleasantly surprised to discover his childlike enthusiasm and curiosity for music. He is a musical titan with several decades of musical experience. Yet, the keen interest he displayed in music made him seem like a new student, like any of us. It made me realise that his humility, his respect for the art form made him the legend that he is. After each class with him, we had several informal interactions when he would recollect his experiences with the legends of the past—especially his two idols Musiri Subramaniya Iyer and Semmangudi Srinivasa Iyer. I would often wonder at the sincerity and dedication of Srikantan Mama—especially his sense of time and his emphasis on diction. Even till his last days, he took great care of his body and his voice. I hope to have imbibed some of his discipline. In late 2002, I was fortunate to be accepted as a disciple by TM Krishna Anna. Even before that, I was one of his innumerable fans ever since he performed at my college, BITS Pilani, in 1998. His Bhuvini dasudane and Nidhi chala sukhama left me spell bound and I felt a deep connection with his music. Learning from Krishna Anna has been a memorable journey. He is a strict task master and does not spare you till you get a sangati right in its entirety. Nothing is left for ‘tomorrow’ or the ‘next class’. His ability to switch on and off is also something I greatly admire—he can be talking jovially with you before class, but once it comes to music he is in a different space altogether. His commitment to what he believes in and his sincerity in everything he does—these are some of the qualities in him that inspire me day in and day out. When did you consider pursuing Carnatic music professionally? My true calling came when I spent four years at BITS Pilani. It was then that I realised the beauty of Carnatic music. My roommate during my college years was another stellar musician DB Ashvin, and those years inspired me to become even more passionate about this pristine art form. After graduating from college, my concert career also started blooming slowly and steadily. My first full length concert was for a sabha in Bangalore called Ananya with Srikantan Mama in the audience. I have been fortunate to be recognised and encouraged by so many sabhas in Tamil Nadu, Kerala, Karnataka and elsewhere. Over the past few years, I have performed in several leading sabhas all over India and have also performed in France, Singapore and Australia. I enjoy performing at different venues—be it the prestigious sabhas of Chennai, the temple audiences in Kerala with their sheer passion for Carnatic music or the Rama Navami concerts with their old world charm in Bangalore.- each of these has a special charm and each concert is a learning experience. Ultimately, I want to be true to my music and surrender to it with humility and respect. You are also a full-time engineer. How do you ensure you strike the right balance between both your careers? It is all about discipline. So long as I am able to practise at least a couple of hours every day, there is always time to pursue both careers. I listen to recordings of the great masters whenever I find time during the day. My day begins with music and I have been fortunate to maintain that discipline from the day I joined the corporate work space. Striking this balance is also made much easier by the support of my parents and my wife Archana, a professional Bharatanatyam dancer. Tell us more about your Muthuswami Dikshitar movement. outlet to this obsession, if I may call it that, through Guruguhaamrta—a trust I formed in 2009. RK Shriramkumar Anna, an artist very close to my heart, named it. My fascination for Dikshitar was stoked by Krishna Anna, when he start researching Dikshitar as well as the Sangita Sampradaya Pradarshini. It was also during this time that I learnt several rare gems from him. Frankly, the grandeur of Dikshitar is something I am just barely beginning to fathom. I can only look at it with awe, wonder and reverence. Through Guruguhaamrta I have been conducting concerts and lec-dems focused entirely on Dikshitar, conducting two flagship events every year (for the past six years). The first is a day-long akhandam at Ettayapuram where several musicians from South India participate and the second a national level Dikshitar Kritis competition through which I hope to encourage more and more students to learn and sing Dikshitar kritis. I would like to share my love for Dikshitar with everyone, and I can only hope that these events will spark the interest and curiosity for the great composer. I am thankful to all the seniors as well as my colleagues who have been gracing Guruguhaamrta with their presence and participation. I am also grateful to all the patrons of Guruguhaamrta, without whom I would not be able to move forward with my movement. Many would say that Dikshitar is an acquired taste, as his compositions are very scholarly and technical, rich in lyrical and musical values. How do you ensure that even the common rasika appreciates your goal and is on board with it? I honestly believe that we could get everyone to appreciate Dikshitar kritis if more and more artists sang them on the concert stage. At a fundamental level, that alone would ensure that rasikas are exposed to as wide a Dikshitar repertoire as possible. At a secondary level, the aim is to present the multiple facets of Dikshitar kritis—musical, lyrical and spiritual. Under my guru’s guidance, I have embarked on a personal mission to sing and document all the Dikshitar kritis in raganga ragas. These ragas are all unique and have an independent identity which is different from the more popular 72 sampoorna melakarta ragas. Dr R Hemalatha, ace violinist and scholar, is collaborating with me on this project to share the theoretical insights of these raganga ragas. Indulge us. What are your favourite renditions of Dikshitar kritis? I’m sure our readers would like to share your love for Dikshitar too. This is really tough. All his compositions are remarkable in their own right. Hmm, if I had to choose, I would say Semmangudi's Chetha sree, Santana Ramaswaminam and Balakrishnam bhavayami. 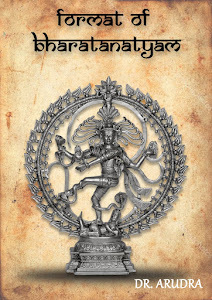 And Krishna Anna’s “Sri Bhargavi bhadram in Mangala Kaisiki and Rama Rama kali kalusha” in Ramakali. These are my all-time favourites. 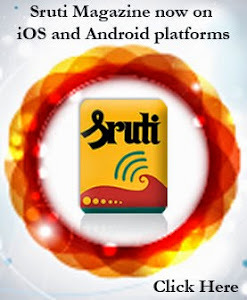 (As part of Sruti's policy, honorifics and titles are avoided as far as possible, even when the writer or artist employs them as a mark of respect to their seniors. This blog post is no exception). I heard from Guruji’s family that he was no more, within minutes of his peaceful passing away yesterday, 22nd November. It was as if my autonomous nervous system took over when I found myself in his house in twenty minutes. He was laid in the very same room where I had met him in 1986 for my first lesson, a dazed and star-struck 11-year old. Fast forward thirty-odd years; only this time I felt the little boy in me despair that the polestar of his musical life would not rise again to guide him. The first thought that I could verbalise from this heart-wrenching, soul-sucking feeling was “Guruji, how am I expected to carry on?”. Over 24 hours have passed since then and I am no closer than before to a convincing answer to the question. I had wept with his sons and daughters, and their sons and daughters. I had clung on to Annapurnagaru, his loving wife who was like a mother to all his sishyas. We were all consoling, and being consoled by, each other. I witnessed the overwhelming display of adulation and sorrow that poured forth from all directions, from maestros to ‘ordinary’ men and women, from all walks of life. He had taught so many, and had touched so many people’s lives through his art. The grief is still very raw, but sharing it with the entire world eases it just a little. I have had the privilege of discussing Guruji’s legacy with him on numerous occasions. I tried to recall some of those conversations with the hope that I would find an answer in them. In those discussions, his attitude had ranged from passionate to fatalistic. The range of attitudes was understandable, for he was impossible to classify. Most eulogies to him read like roster lists of awards and achievements, the breadth and depth of which boggle the mind. There can be no boxing his genius. Indian music was his second nature, and within this broad vista there was not a single idiom that he hadn’t fully internalised and worked his magic upon. Voice, instruments, opera, cinema, language, movement—he was monarch of all he surveyed. His purported muse was the ancient and revered Goddess of Music. Given this, how can anyone carry forth his legacy? Nowhere was his genius more iridescent than on the concert platform. Having accompanied Guruji as saath or pinpattu on numerous occasions since my 15th year, I had made a hobby of observing his face and gestures from my unique vantage point. Like a trained astronomer detecting an astral shimmer by looking at it sideways rather than straight on, I’d looked lovingly at the smallest changes in facial expression, hand and body movement, and correlated them to a glide here, a crescendo there, a korvai here, a karvai there or an effective silence (recalling nisabdam, the ultimate syllable). I sensed that his gestures were somehow connected to a vast, deep, never ending font of creativity, the decoding of which would take a major breakthrough in AI to endeavour to crack! Therefore is it even humanly possible to recreate his on-stage magic, and keep his legacy going? Perhaps the greatest lesson that Guruji taught was not musical, but behavioural. He would often joke that he never once practised his art at home because deliberate sadhana was habit-forming; and habits lead to addiction! Many years later I encountered similar veins of thought in the practice of Sahaja Yoga and Vipassana. He would not prepare ahead of a concert, choosing instead to act on the natural ebb and flow of the moment. From wondering if he was being flighty I have come to realise that this is how he connected with his childlike spontaneity. When during adolescence my performing sruti dropped from a soprano G (5) to a baritone Bb (½) in a matter of months, instead of advising me to try and sing in an accepted concert pitch of say C/C#, he asked me to “choose whatever suited your singing voice comfortably”. This ran against conventional wisdom, but after many years of studying voice production, I have now come to realise that his advice was in fact based on physiologically and aesthetically sound principles. On reflection, the easier way to carry on might be to embrace the joie de vivre behind his steady flow of maxims and witticisms. His was a mind open to ideas from all directions, untrammelled by conventional boundaries, instead seeking purposeful amusement from all quarters. He admired, nay prised beauty from everyday experience. His compositions reflect his unity: gods and saints were treated to the same silken touch as railway stations and political tussles. He once told me that he felt no less than a Sankaracharya; for while seers were fully absorbed in the metaphysical, he was fully given to nadam. What seemed to me like a whimsical quip then, strikes me now as the musings of an evolved being, forever in the pursuit of happiness. As it was with everything Guruji, his deceptively simple, fun-filled approach to living was the embodiment of the mystic ideal of swadharma. His fierce independence and individualism were his way of being in touch with his feelings, and acting in direct accordance with them. His was the living essence of a higher ideal. He was a great soul, and remembering his broad, ever-present smile would therefore be my first step towards “carrying on without Guruji”. The great Balamuralikrishna will be missed by his fans and disciples. The denial of India's highest civilian honour Bharat Ratna to this multifaceted genius must rankle in the minds of Carnatic music rasikas. He will live through his disciples and hundreds of compositions. A few years ago a friend hosted a small party in Chennai with MBK and wife as guests. On being asked then about his generously consuming ice cream, he smilingly said that ice cream would not affect his throat. Two years ago, at the end of a concert in a US city, my son complimented him saying, "Your singing is just as it was forty years ago." The maestro's response was: "Is there no impromement at all?" The immortal voice has been stilled, but his music will live on. Balamurali was not a legendary musician; he was a phenomenon. He was a controversial musician, criticised by the orthodox as a breaker of tradition but therein lay his innovative genius. Who can honestly say they have not been seduced by the magic of his melody? His voice could soar like an eagle and, with equal felicity, plumb the depths of the lower octaves. 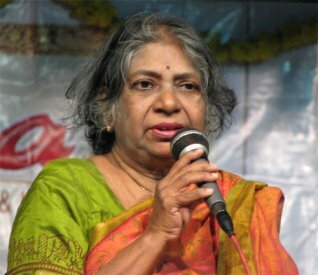 If DK Pattammal was almost the only female musician who could sing even complex kritis with clear enunciation and pronunciation, without lapsing into the cardinal sin of padacchedam, it can be asserted without fear of contradiction that Balamurali was almost the only male musician who could do likewise with what my English Professor used to call ''the slippery ease of the first person singular". I recall with immense pleasure the youthful team of M Balamuralikrishna, MS Gopalakrishnan and TV Gopalakrishnan taking the Carnatic music world by storm with their infectiously joyous but strictly classical concerts in the 1960s and seventies. I had occasion to host Balamurali for lunch sometime in the 1970s when I was posted in Chandigarh. My wife and her friend asked him, with some trepidation, if he would teach them a kriti. He graciously did so. The kriti was the rarely heard but delightful Dakshayani rakshamam dhritam in the raga Naganandini. My friend Ramesh from our IIT days in the 1980s called me last evening on my father’s mobile as I was headed back to T'Nagar from Mandaveli with the terse line, ‘Dai, Balamurali poittar da’. ‘We had just spoken about him at length during our conversation at the IIT Alumni Club yesterday’. I opened Facebook soon after reaching my parent’s place; sure enough there were messages from friends. There were pictures posted by NRI friends who had posed with the bard for photographs and some recent selfies!. There were newspaper reports shared on social media. 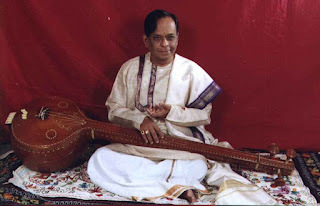 There were also videoclips of the maestro’s performances shared liberally on Facebook; most noteworthy amongst these is a videoclip from the 1965 film Tiruvilaiyadal featuring the song Oru naal podumaa’. An endearing song sequence in the film, this classic represents the anti-hero TS Baliah, arrogant to the core, throwing his gauntlet into the ring, declaring himself to be the lord and master of music itself. This dare is met later in the movie only by the illusion of the entire universe coming to a screeching halt in a pregnant pause in the midst of the protagonist Sivaji’s rendition of an advaitic Pattum nane, bhavamum nane. Situation apart, every phrase in Oru naal poduma describes everything that is special about Balamurali’s music. It takes a lifetime to discover his music; my good friend Prince Rama Varma, a staunch devotee and disciple of the maestro, has spent several years of his life doing just that: discovering and teaching Balamurali’s compositions. Oru naal poduma declares that the singer’s voice is superior to the sound of the best of musical instruments. Isn’t it true with Balamurali? His honey-sweet voice captivated the hearts of millions. What a natural, supple voice rich in overtones, capable of superhuman acrobatics traversing three whole registers and more, making leaps between awkward intervals spanning an octave plus a seventh! And how sweet it was and how effortless the singing. And how incredible that a human voice would obey his complex musical orders. This was a voice that endeared itself to connoisseurs of Carnatic music as well as to the millions that were mesmerized by Tiruvilaiyadal as well as the millions more that were dumbstruck by the Ritigowla stunner Chinnakkannan azhaikiran in the contemporary classical idiom in the 1976 film Kavikkuyil in the hands of the then emerging composer Illaiyaraaja. ‘Crowds will come running to see me’, declares the song. And so did the teeming crowds in Madras the bastion of the orthodox sabhas of cutcheri music to listen to a singer from the neighbouring state of Andhra Pradesh. Here was a musician who didn’t belong to the Kaveri delta, did not hail from an established Tanjavur lineage; it didn’t matter that he was a maverick in his own way. The crowds kept coming, even during his tour of the United States a couple of years ago. Balamurali’s singing stood out. Markedly shorn of the heavy dose of kampita oscillation that brings the customarily expected Carnatic feel, his music had a fair share of precise straight notes that adorned the text that came to life with his bhava-filled rendition. It didn’t matter whether the text was written by Tyagaraja, or Bhadrachala Ramadasa or Sadasivam Brahmendra or Jayadeva or by Balamurali himself. His recordings have left a mark and his live performances have disappointed none. The singing appeared effortless, accompanied by a trademark youthful smile that adorned the maestro even when he was well in his eighties. And there was his sense of humour. I had heard of the time he apparently inadvertently stepped on the sharpened fourth, the prati madhyamam while singing Madhyamavati. Undaunted by this faux pas, the maestro carved out a few more phrases using the scale SRM#PNbS, spontaneously named the raga Pratimadhyamavati and oscillated between Madhyamavati and Pratimadhyamavati with a brand new composition minted right on the spot. Echoing the words of Oru naal poduma, I have no choice but to add the cliched observation that it will take ‘more than days’ to explain the brilliance of his work. Innovation within the realm of the self-imposed bounds of the cutcheri was just second nature to him. Balamurali is credited with a few hundred compositions covering a range of compositional forms including music scores for films. His newly sculpted ragas found expression through his compositions; some like Mahati even made it into films and turned blockbusters. And there were the sruti bheda pieces. A long drawn alapana in Abhogi with a sruti bhedam resulting in Valaji or the sruti bheda tillana with wicked twists and turns starting with a benign Kalyani immediately come to mind. There was never a dearth of excitement in his concerts. The driving force behind his musicality was his nonchalant muse. Beneath this virtuosity lay a progressive and adventurous spirit that did not believe in shackles or constraints of any form. Here is a quote from Sruti magazine’s interview with Balamurali Krishna in 1984. ‘Tradition is nothing other than the basic grammar around which a superstructure is built’. He goes on to say in this interview that anyone is free to innovate and that only those innovations that ‘are good’ will secure the approval of rasikas for sustained periods of time and continue as traditions; and anything that survives the test of time is a classic regardless of whether it is a composition featured in a film or whether it is an innovation within the cutcheri paddhati. What could be a better way to pay a tribute to his unbridled spirit than quoting a dare that he throws at Sruti readers again in this ‘must-read’ interview in 1984. “Those who harp on tradition (and tradition, the way they understand it) should either go along with the traditional musicians to heaven or understand what tradition really is”. 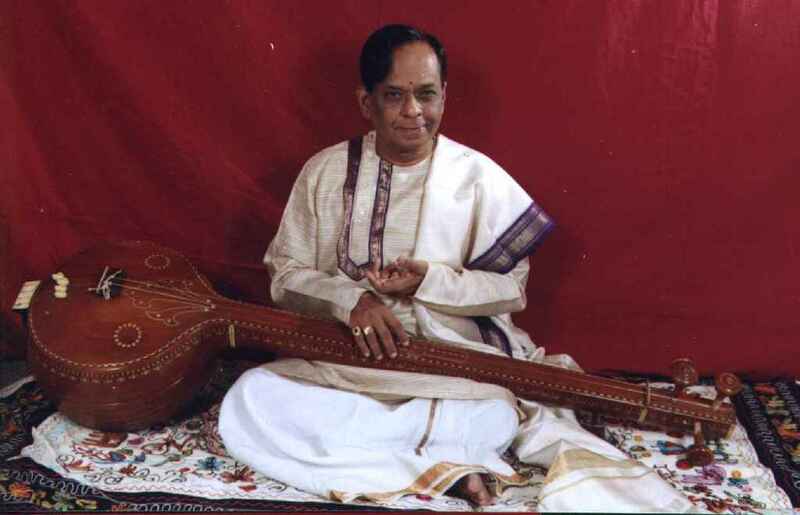 Veteran Carnatic musician Mangalampalli Balamuralikrishna died on Tuesday 22 November in Chennai. He was 86. An incomparable musician with a silken voice and a charismatic personality, Balamuralikrishna was a versatile artist with a long, noteworthy and enviable career. He was a master of many musical instruments, a prolific composer with tremendous creativity, an affectionate guru, a non-conformist, a playback singer, a multifaceted personality who reached the acme of fame by swimming against the current. He was a prodigy, who became a genius. He was A Top graded artist in All India Radio which he also served as Music Producer. He was well respected by Hindustani music maestros with whom he performed jugalbandis. He was decorated with several prestigious awards like the Padma Vibhushan, the Central Sangeet Natak Akademi Fellowship & Award, the Sangita Kalanidhi, Nadabrahmam, the Kalidas Samman, Isai Peraringnar and Chevaliers des Lettres, to name a few. His passing away is a great loss to the music world. The tenth and final day of the festival was a grand culmination of all the occurrences of the ten days, with the crowd in the Mylapore area flocking in as early as the first performance, which featured many young artists coming together for a Carnatic Combo concert. 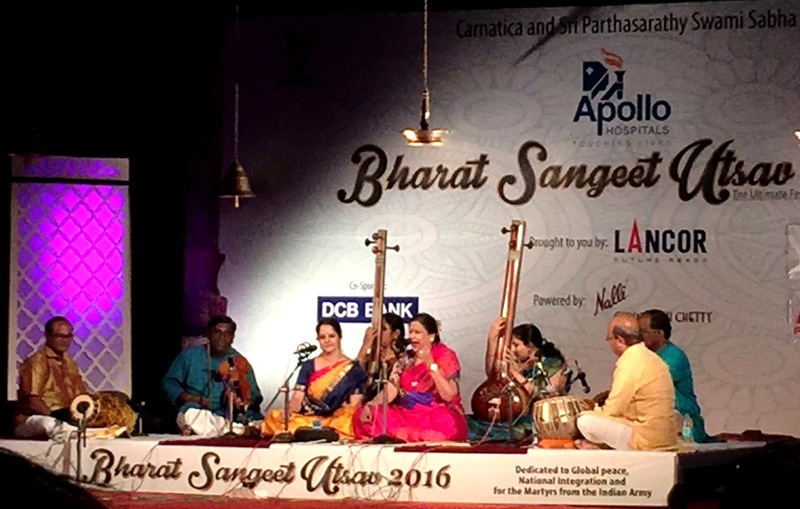 The unique partnership of Sriranjani Santhanagopalan (vocal) and Ramana Balachander (veena) was introduced as the first program of the final day. Carnatica called their program a Carnatic Combo concert, bringing to stage not only the vocalist and vainika but also an ensemble of accompanists made up of B. Ananthakrishnan (violin), Vijay Natesan (mridangam), K.V. Gopalakrishnan (khanjira), and Chandrasekhara Sharma (ghatam). Most notable was the tri-raga pallavi, weaving together Dharmavathi, Sarangi, and Hamir Kalyani in a pallavi set to chathurasra jathi dhruva talam. The challenge in layam was handled masterfully by both artists, with Sriranjani guiding young Ramana through certain kanakkus, and the presence of more percussionists on stage than one is used to in a Carnatic kutcheri actually worked to enhance the performance. At moments, the combination of only khanjira and ghatam was quite satisfying, making the re-entrance of the mridangam even more impactful. The concerts that have been the most anticipated in this festival have still been the traditional, Sampradaya kutcheris, and the final day was no different. The crowd filed in to see the combination of Vijay Siva (vocal), S. Varadarajan (violin), and K. Arunprakash (mridangam) and they definitely weren’t disappointed. 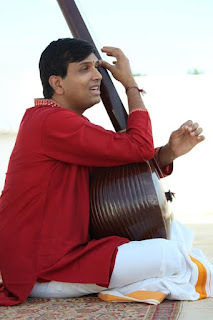 Siva chose the magnificent Maa Janaki in Harikambhoji and did not disappoint, though I was pleasantly surprised by Arunprakash’s brief tani, something I am told is reflective of his unique playing style. In a time when every mridangist is focused on showcasing all their abilities in a matter of 7-8 minutes, Arunprakash’s pacing is a breath of fresh air and something that we all lapped up. After a felicitation of chief guest B.V. Jagadeesh, a California-based businessman, and his family, the Trichur Brothers took the stage to present a grand finale: Anuboothi. 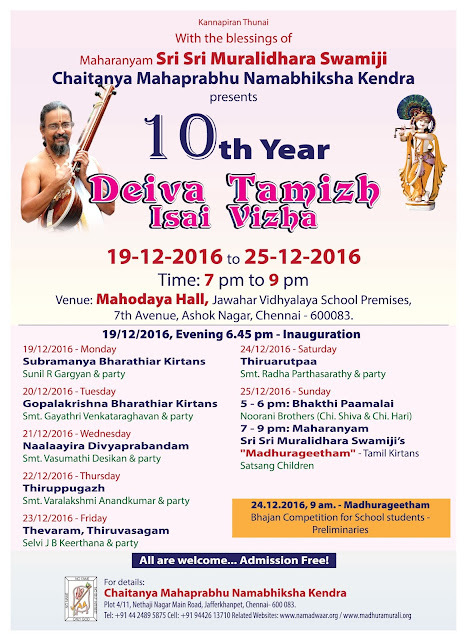 The band brought together well-known young musician Navneeth Sundar along with many others including Trichur R. Mohan, mridangam vidwan. The brothers presented an interesting amalgamation of numbers that highlighted their Keralite roots and also gave the crowd some time-tested film favorites. At one point, Srikrishna Mohan – the elder brother – said to the audience: “We were told never to present this in Mylapore of all places.” The crowd laughed and a gentleman behind me said to his wife, “Well, this is Alwarpet.” Indeed, it reflected the somewhat more open-minded nature of the audience, willing to vary their musical palate to suit changing presentations. ‘Ellam Inba Mayam,’ conceptualized by Shashikiran, brought classical-based film melodies to life with young Bharatanatyam talents Bhavajan Kumar, Sudharma Vaidyanathan, and Shruthipriya Ravi essaying select pieces on stage. During the rest of the event, vocalists Girija Shankar, Deepika Varadarajan, and Madhu Iyer sang pieces from both regional and national cinema. Evergreen melodies like Lag ja Gale and Bole Re Papihara were well-appreciated, though many of these pieces require a certain weightage and maturity in approach that were lacking during the presentation. While Girija Shankar’s fine voice complemented many pieces he presented, Ullathil Nalla Ullam required more depth to do justice to the original masterpiece. Yet, dance-inclusive pieces shone and flawless coordination in choreography, notably in Aadaadha Manamum Undo. A dance performance of Nityashree’s Ellam Inba Mayam, as per the program’s namesake, was captivating. There is no time in history that needs this message more than now, and the presentation that followed by Saketharaman and Praveen Godkhinde represented this message quite well. Segments produced by Praveen’s flute were sublime, with the performance reaching its height during his presentation of Sant Tulsidas’ Shri Ramachandra Kripalu Bhajamana. The evening concluded with a recital on padams and javalis by Priyadarshini Govind. In such an enactment, ability to convey the humanistic emotions that are described lyrically is key, as many padams and javalis rely heavily on abhinaya and expression rather than physicality and the use of jathis. Priyadarshini was a more than suitable-choice, captivating the audience. The use of Tiruvarur Girish’s vocals was even more apt as the Brindamma lineage is known for the vast repertoire of padams and javalis that Brindamma held great command over. While his vocalizations complemented the dancer’s understanding of the compositions, the recital was filled with slow-paced pieces that gradually began to weave together unconsciously. Implementing items of varying kala pramanams and embracing silences in the pieces would have served the performance well. Day 8 began quite solemnly around the globe, when countries around the world expressed their desolation as news of the American election results came in. A sudden cash overhaul throughout India added to already-high tensions. Yet, a reminder of music and a festival for national and international peace provided a rather soothing and uplifting escape. The first event of the day, the laya jam, brought together khanjira, morsing, ghatam, mridangam, and konakkol artists to present a unified understanding of rhythm through different vadyams. The laya jam concept has been presented multiple times throughout this year; recently, Arkay Convention Centre hosted a khanjira quartet and other presentations have taken place to highlight the use of percussion in Carnatic music. Yet, the innovation presented in this laya jam was commendable: the five diverse instruments were used to present a ‘one, two, and four’ formatted piece. A khanjira solo by Shree Sundarkumar began the presentation, followed by a ghatam duo by N Guruprasad and Chandrasekhara Sharma. A quartet of konnakol, morsing, khanjira, and mridangam then showcased the interplay of instruments by Somashekhar Jois, Sai Subramaniam, B.S. Purushothaman, and B. Sivaraman respectively. The jam succeeded in involving the audience in the capabilities of percussive instruments, something that can isolate listeners during a tani avartanam of a concert. Aruna Sairam and Ronu Mazumdar then joined together on stage to present ‘Voice and the Wind.’ It proved to be a rather novel demonstration of their individual styles and brought out a softer side of Aruna Sairam’s vocalizations that is less prevalent in her solo kutcheris. The two blended well on stage and was enjoyable to listen to. The last event of the day was jazz-Carnatic collaboration between the violin duo, Ganesh-Kumaresh, and Keith Peters, bass guitarist. Keith has been seen on many Carnatic stages and in the film world and in collaboration with Ganesh-Kumaresh previously. However, ‘Carnatic Chills’ presented many novel ideas and strong support by accompanists Anantha Krishnan, Arun Kumar, and Anada Prasanna Nayak helped create a well-rounded performance for listeners. "Just came to know from a friend that Dr SAK Durga has passed away. I have known her for more than eight years and she was a great source of guidance in my research. 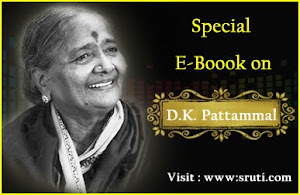 Having learnt from greats such as Madurai Mani Iyer, Maharajapuram Viswanatha Iyer, Ramnad Krishnan, M Balamuralikrishna, and T Viswanathan, her width and depth in the theoretical and practical aspects of Carnatic music were hardly surprising. What was touching was her humility despite all her greatness. I was lucky to gather her analysis as a voice culture expert, on the voices of great Carnatic vocalists of the past and the present. The other favourite topic of our discussions was Madurai Mani Iyer. I vividly remember a couple of stunning lecdems that she gave in the past few years. One was on South East Asian music (Japanese, Vietnamese) and the other on folk music's contribution in the expansion of traditional Carnatic ragas. I have recorded a few of our conversations. I do hope I can write them as a long interview. 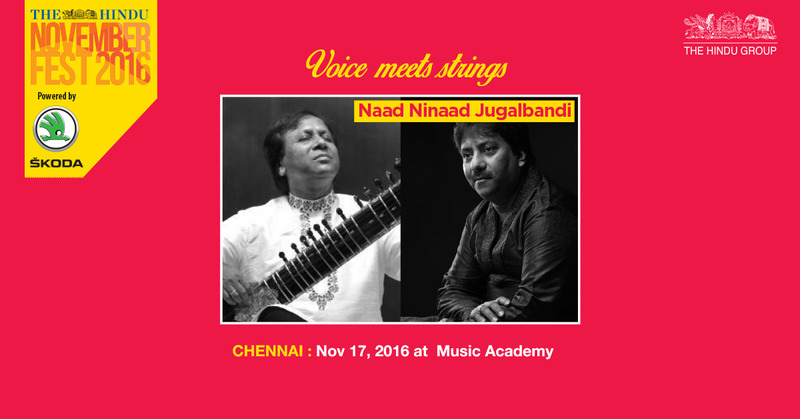 An interesting jugalbandi, Naad Ninaad, between brilliant vocalist Rashid Khan of the Jaipur Atrauli gharana, and sitar maestro Shahid Parvez of the Etawah gharana, will be held on 17 November. Day 4 was easily one of the most-awaited days of the festival. 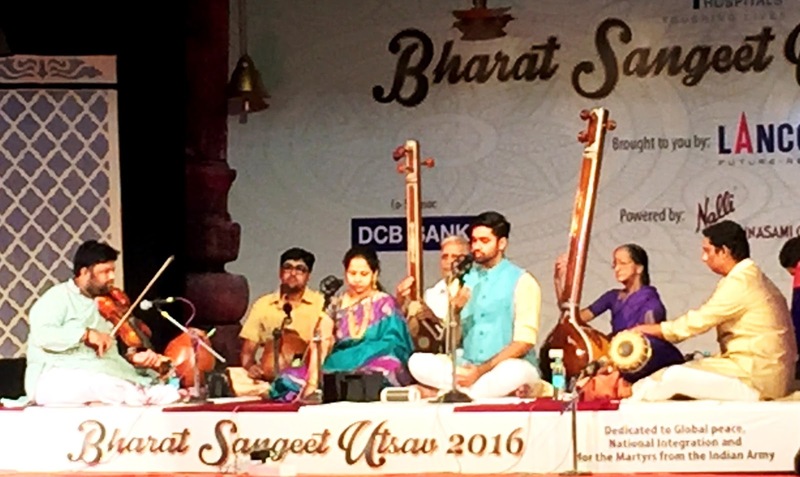 A katha kutcheri by Dushyant Sridhar, the rare union of Abhishek Raghuram and grand-uncle Lalgudi GJR Krishnan on stage, and a Malladi Brothers concert drew crowds to the hall. Dushyant Sridhar’s katha kutcheri, a presentation on Narayana Teertha compositions sung ably by Anahita and Apoorva Ravindran, was well-executed. The storytelling was captivating and relatable, with slight humour keeping younger viewers as invested throughout the 2-hour performance. 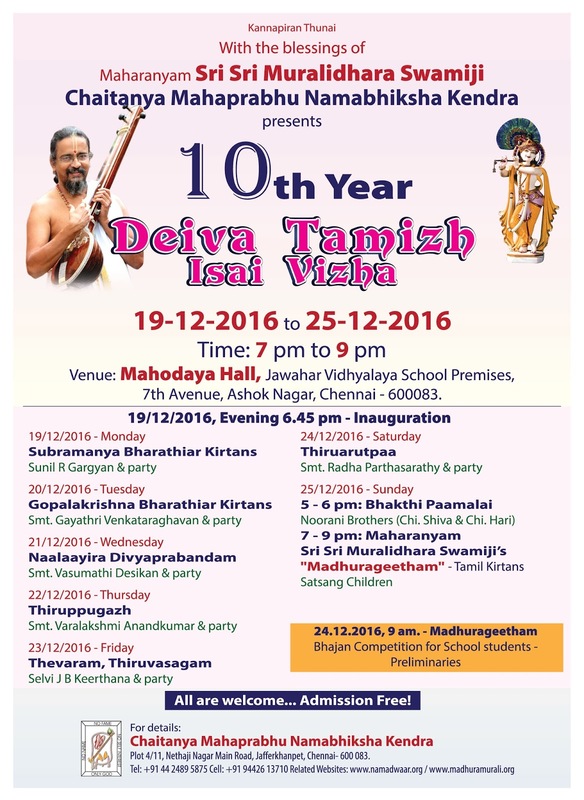 A newfound appreciation of Narayana Teertha’s classic work was apparent and the harmony of violin and mridangam enhanced the presentation. Young Ramakrishnan Murthy made his appearance next in a sampradaya kutcheri. While his voice gave way to the Chennai monsoons, resulting in a bad cold, his effort on stage and humility in thanking his rasikas for their support, even through the “not-so-good” times were much appreciated and elicited quite a few laughs from the audience. The accompanists truly shone, with Charumathi Raghuraman proving her mettle on the violin once again. Manoj Siva and Chandrasekhara Sharma interacted with ease to provide apt tala support. Chathwari, bringing together Abhishek Raghuram (vocal), Lalgudi GJR Krishnan (violin), Guru Karaikudi Mani (mridangam), and Ghatam Suresh, was highly anticipated and exceeded expectations. Creative play between Abhishek and Lalgudi GJR was at its best, reaching a new height in Koteeswara Iyer’s Arul seyya vendum ayya in Rasikapriya. Korvai preludes and inventive patterns highlighted Karaikudi Mani’s prowess which Suresh successfully matched during a thunderous tani avartanam. The vocalists then concluded with a tillana medley, displaying bits of Lalgudi Jayaraman’s signature tillanas in Behag, Pahadi, and Desh, to name a few. Impressive were the observance of a single tala structure and the flawlessness in which voice and violin moved swiftly from one tillana to the next. A rare opportunity to see stalwarts exhibiting such advanced artistry made the concert one of the best we have seen thus far. The day ended with a peaceful rendering by the Malladi Brothers, a duo known for bhava-rich music that bears the unmistakable stamp of the Pinakapani-Nedunuri school. 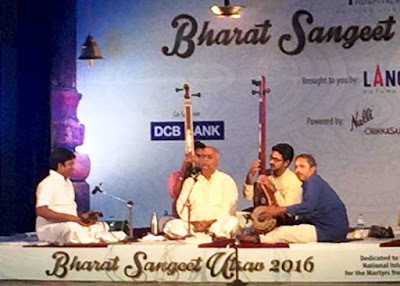 The duo’s inclusion of many rakti ragas was apt for the day, benefitting highly from the saukhyam that the brothers are known for. 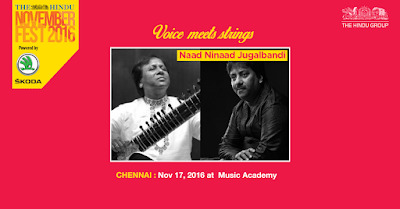 Nagai Sriram (violin) proved to be a fitting complement to the duo’s vocal timbre and Mannargudi Easwaran’s energetic mridangam strokes kept the concert moving, with B.S. Purushotham (khanjira) adding nuanced touches to create a complete performance. Day 5 was a day for storytelling with each programme focusing on a thematic presentation of a given topic. While Dr. Gowri Ramnarayan’s Miradasi chronicled the life of Meerabai and her immeasurable bhakti, Visakha Hari’s Ramanujar Vaibhavam enthralled the audiences who could not even find seats in the hall on Monday. Both Jayashree Vaidyanathan’s morning kutcheri and Udayalur Kalyanaraman's sampradaya bhajanai involved soul-stirring renditions of classics. The kutcheri was an appropriate start to a leisurely Sunday morning and competent accompaniment by Kovai S. Chandran (violin), Manikudi S. Chandrasekharan (mridangam), and N. Narasimhan (ghatam) rounded out the solid presentation. Udayalur Kalyanaraman’s bhajanai, an interaction between classical ragas and energetic namasankeertanam was engaging as well. Miradasi, conceived, written, music-directed, and anchored by Dr. Gowri Ramnarayan, told the tale of the Rajasthani poet Meera. The production revisited a simpler time when music could heal one’s wounds and provide solace to the young Meerabai and interwoven songs of Meerabai’s placed beautifully within the narrative painted the picture of Meera’s Krishna playfully prancing around the garden. Especially powerful were Nisha Rajagopalan’s renditions of Daras Bina and the classic Hari Tum Haro that conveyed Meerabai’s longing and steadfast devotion with authenticity and pathos. The presentation reached its peak with the three vocalists (Nisha, Amritha Murali, and Vignesh Ishwar) joining in on Chakar Rakho Ji in celebration as Gowri took us through the streets of Brindavan, extolling Krishna. What followed was a crowd that is difficult to come upon during the off-season. An overly packed auditorium waited anxiously for Vishaka Hari to begin and soon, rasikas began occupying the stage and even seating themselves in the aisle ways! 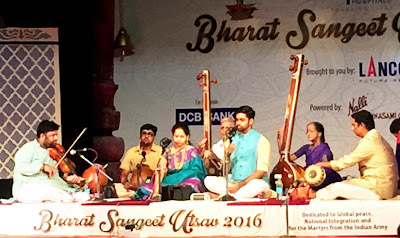 Her stirring rendition of Ramanujar Vaibhavam, curated specifically for Bharat Sangeet Utsav 2016, took advantage of her comfort in the Harikatha space as well as her vocal prowess that is often overlooked. The team of accompanists including Padma Shankar (violin), B. Ganapathyram (mridangam), and Trichy K. Murali (ghatam) enhanced the rendering greatly. The day concluded with Nithya Kutcheri by the Priya Sisters, bringing together Bragha Bressell, Gopika Verma, and Sailaja in an innovative union of Bharatanatyam, Mohiniattam, and Kuchipudi, respectively.There was a confluence of styles on stage as the artists presented both solo and combined pieces. This was reflected brilliantly in Delhi Sairam’s assimilation of adavu patterns on the mridangam . A cause for despair still was the mass departure of a large section of the audience within 30 minutes of the programme, a battle that dancers still face as they take the stage. Day six began with the joint Carnatic kutcheri of vocalists of K. Gayathri and Ashwath Narayanan. Accompanied by B. Ananthakrishnan (violin) and festival favorites Delhi Sairam (mridangam) and Chandrasekhara Sharma (ghatam), the duo presented a thematic concert on Siva-Sakti, utilizing their individual strengths to resemble the shifting power within the deities and the amazing strength of their union, reflected well in the vocalization. The artists highlighted the yati lyrics, taking great care in emphasizing both srotovaha yati and gopuchcha yati whenever possible and also explaining the significance of such techniques to the audience. The lineup was carefully crafted by the artists and the magnificent Ardhanareeshwaram was done considerable justice, especially by Ashwath whose range and free-flowing voice were a welcome surprise. The pallavi sang the praises of Indian diversity, progressing fluidly from Carnatic Abheri (Bheemplaas) to Mohanam, Hamsanandi, and a very apt Desh that wove seamlessly into the patriotric Vande Mataram. The jugalsangeet was a rare match of vocal prowess and underscored the beauty of both musical forms. 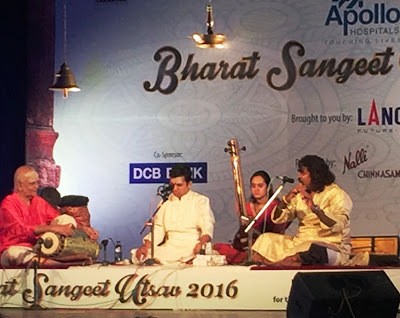 The theme was continued by a jugalbandi between Hindustani vocalist Sanjeev Abhyankar and Kunnakudi M. Balamuralikrishna. Though the former focused more on lyrical intricacies, the concert took full advantage of the singers’ ease in adjusting to each other’s stylistic tendencies. The day left no stone unturned in celebrating and cultivating national integration through the arts. Retirement? Never heard of it!